It’s that time of year. We are all counting down the days to Summer. 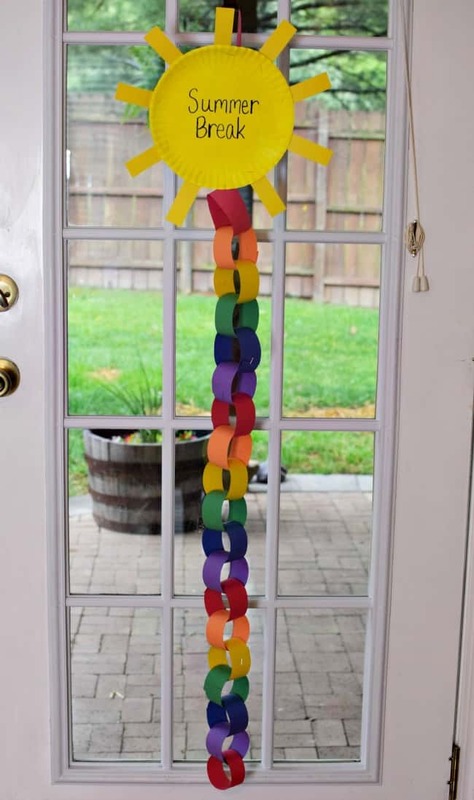 Why not make it a fun craft idea and make this rainbow and sunshine summer break countdown. Summer break countdown… Already? Yessss, I can’t believe it either. I know there are some people who start school late and have a good two months left to go but we are on the downhill slope. Yet again! Whether you are ready to start the countdown or not today I wanted to share with you a fun activity to do with the kids. A summer break countdown… We have them for Christmas, why not summer break? We get just as excited about that around here too. 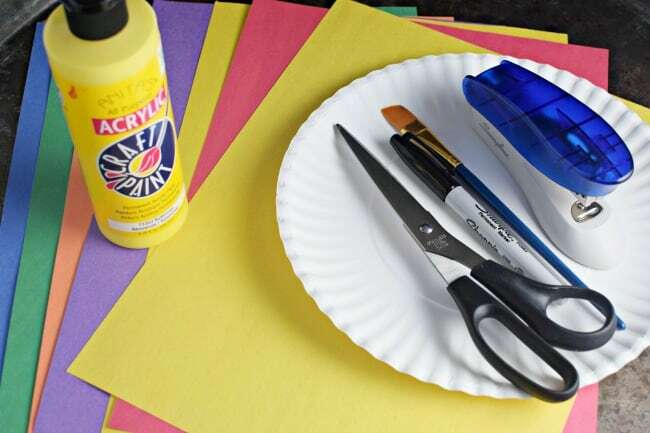 Start off by painting your paper plate yellow. No need to dirty up a paint palette or waste an extra plate for the paint. Just pour a little on the plate you will be using and start painting. While the paint is drying, cut out strips of construction paper for how many days you have left in school. Staple the strips together in a chain. We used rainbow colors and alternated them to look like a rainbow but you could choose all solid color. Whatever your child (or children) want to go with. 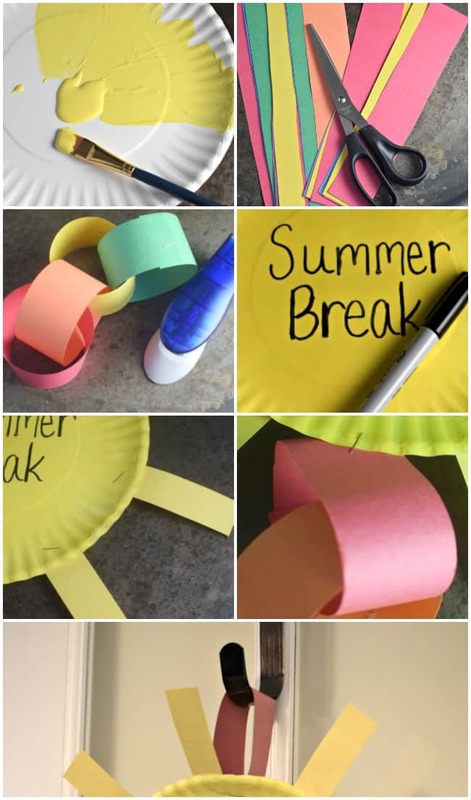 Now that the paper plate should be dry, use your sharpie marker and write out summer break, summer countdown, or just summer. However, you want to label your sun. 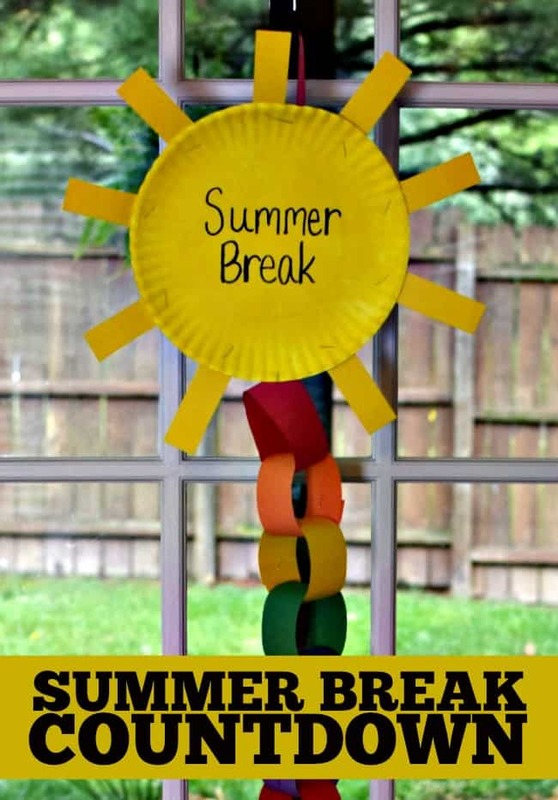 Using your yellow piece of construction paper cut out strips for the sun rays. You can either glue these on the back of the plate or do like we did and staple them on. We touched our staples up with a little yellow paint too. Staple on your summer break countdown chain. The last part is stapling on an extra strip to hang it with. Hang it up and start counting down! I can’t believe how fast this school year has flown by. Although I say that every single year. I feel like the older I get (and that my child gets) the faster the days go. Time can slow down any day now. If you enjoyed this Summer Break Countdown post you might also enjoy. 10 Experiences for the best summer ever!